Discover the situation as at 1st January 2014 in Berlin! At mid-2013 over 100,000 screens were equipped with DLP Cinema™ or Sony SXRD™ technology, coming to represent over 80% of all commercial screens. 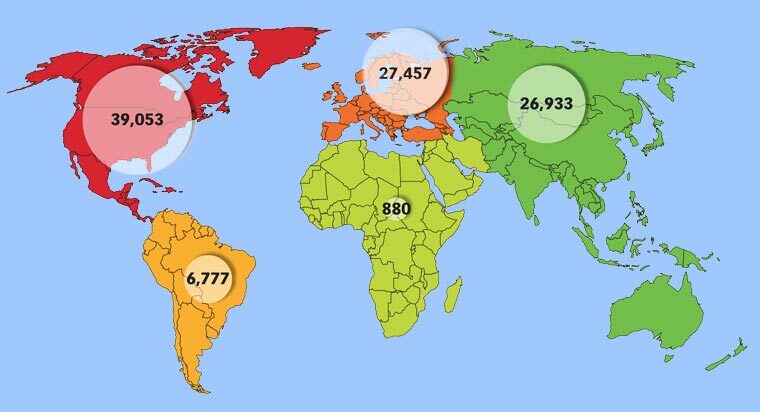 Of the world's 101,100 digital screens, over 39,000 - or around 39% - are situated in North America, whilst, with 27,457 theatres having converted to the new technology, Europe now represents around 27% of overall digital screens, a percentage very similar to that in Asia and Oceania. As regards the growth rates, the areas that have recorded the largest growth rates over the first six months of 2013 are Latin America (+40.6%) and Africa and the Middle East (+33.5%), whilst digitalization has slowed down in those countries that are nearing the end of the conversion process, such as Europe (+9.5%) and above all North America (+7.6%).